The security of the whole free world was at stake! Every agent of the United States was put on extra alert! That’s how Captain Atom came to be allied with Nightshade, one of the most attractive spy smashers that our country has ever had! Together this powerful pair find themselves confronting an almost impossible task of capturing a man who could disappear at will. But how do you catch a ghost? And so begins a new chapter in Captain Atom’s life. 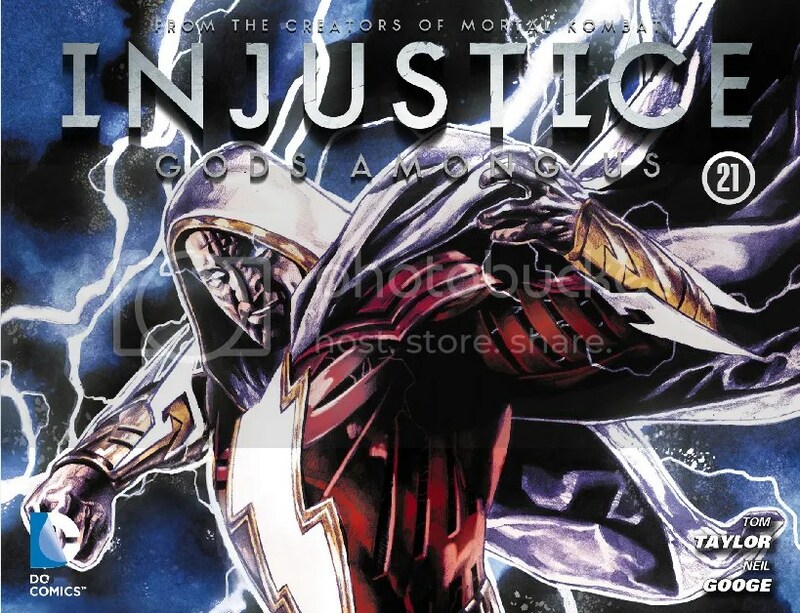 He gains a new nemesis and a new friend in this issue. Both of which would follow him into his new life at DC Comics twenty-one years down the road. Cap is informed he’ll be working with a female agent named Nightshade (that darling of darkness). This will be her first mission. She arrives, her black ponytail bouncing. She wears a mini-skirt over black tights and a mask – clearly she is a super-hero – but her powers are not yet revealed. She and Cap are given tickets to a party being held that night by “Alec Nois.” The military believes a few of the Ghost’s agents will be there. Meanwhile, “in another part of Washington,” the Ghost arrives in a darkened office and removes his mask. Through flashbacks we learn his name is Alec and that he suffered hardships when he was growing up (girls didn’t like him because he was poor and boys didn’t like him because he was studious). He built a teleportation device and used it to rob banks and the like. His goal is “Operation Golden Ghost,” which he will execute once he has stolen the floor plans for Fort Knox. Meanwhile, Allen Adam is readying himself for the party, thinking to himself that Nightshade will be more of a burden than on asset. As Eve Eden (Nightshade) prepares herself for the party, she is thinking how great it will be to be teamed up with that hunky Captain Atom (1960s comic stories at their best here, folks). Later, at the Alec Nois party, Adam is having trouble figuring out which of the guests could be the Ghost. He is impressed by Nois’ wealth, though, wondering how Nois made his first million. Then all heads turn to see Eve Eden arrive (she is a “jet-set” leader and a Senator’s daughter). Alec flirts with Eve. Adam takes notice of how hot she is. 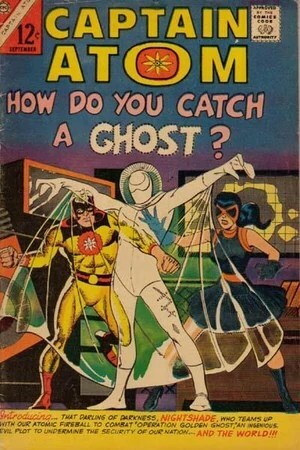 Cap doesn’t know Eve is Nightshade, Eve doesn’t know Adam is Captain Atom, and nobody suspects Alec is the Ghost. Adam sees a waiter pass a message to a dude. He follows the dude to another room, where he is on the phone arranging Ghost stuff. Eve also saw the exchange and makes an excuse to break away from Alec, who also wanted to break away from Eve to do more Ghost stuff. Eve follows the dude outside. She changes into her Nightshade costume instantly (that must be her super power – super clothes changing). She flips the guy and demands to know what the message said. Just then, the Ghost materializes before her. When she takes a swing at him, he vanishes and reappears a few feet away. This is when Captain Atom joins the fight. With the wave of his hand, the Ghost teleports Nightshade and Cap to another dimension. Before long, the two are teleported back where they came from, but the Ghost is long gone. Cap remembers overhearing the Ghost’s flunky mentioning “section 18.” Nightshade tells him section 18 is a secret file and map room at the Pentagon. Cap picks her up and they fly off. The two heroes burst in on the Ghost in section 18 just as he has located the plans to Fort Knox. He teleports the blueprints away, makes a stupid Beatles reference, and vanishes before Cap can get him. He reappears before Nightshade and taunts her. This goes on for a little bit. The heroes can’t catch him. Before he teleports out for good, he says, “I’m going to do what Goldfinger failed to do! I’m going to steal the gold in Fort Knox!” Man, this guy loves his pop culture references. The two heroes return to the Nois house and change into their civvies. Adam is shocked to learn Eve Eden is Nightshade. Eve thinks Allen Adam is a hottie. When Adam asks her why she does the super-hero thing, Eve dodges the question. They return to the party. The next morning, they make their report to their C.O. The next morning? What if the Ghost’s plan was to go straight from the Pentagon to Fort Knox? Was it really necessary to return to that party and then report their findings the next day? It was okay, though, because the Ghost didn’t act that night. Back home, Alec “Ghost” Nois studies the blueprints. He talks about getting a crew together for the job. Adam and Eve (yes, I know) opt to drive to Fort Knox in their civvies, afraid their super-identities would draw too much attention (but Cap can turn invisible and really doesn’t even need Nightshade!). They pass a suspicious truck on the road and think it might be tied in to the Ghost’s heist. The Ghost receives word that everything is nearly in place for the heist. He collects a “machine” that will help him with his heist, makes a Lincoln reference (sheesh), and teleports away. Fort Knox is on high alert. For some reason, Cap and Nightshade dropped their plans to approach stealthily. They are in an Air Force helicopter in full costume when the Ghost arrives. Cap jumps out and flies down. Nightshade waits for the helicopter to land and then takes out four armed thugs in hand-to-hand combat. So she’s a scrapper. Inside, Cap uses is invisibility power to freak the Ghost out. He snatches the Ghost’s machine out of his hands. Still invisible, Cap socks the Ghost in the face and the Ghost goes down. Figuring his teleportation power comes from his gloves, Cap sets out to remove them. But the Ghost was only feigning unconsciousness. He kicks Cap in the face. As Cap is going down, he rips the glove he has clenched in his hand. The exposed circuitry goes haywire and the Ghost is enveloped in a mass of orange energy. Cap believes the Ghost is defeated for good, but Cap doesn’t realize he is in a comic book and nobody stays dead. This issue also includes an article about Sumo wrestlers and a short two-page “educational” comic featuring Judomaster’s “favorite throws” by Frank McLaughlin. 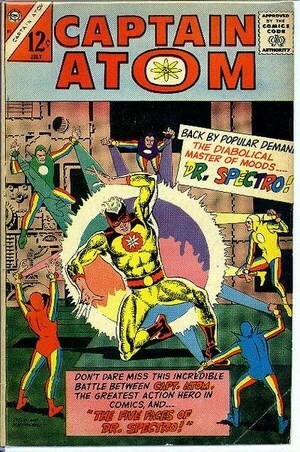 Also a special announcement from Charlton that soon they will start printing fan letters in the pages of Captain Atom. This one is pretty good. I would have liked to have learned more about Nightshade. When I was introduced to the character years later, she had the power to travel long distances quickly via black portals she generated and could cross dimensions. Perhaps some of that will come into play here in the Charlton universe later on. A solid effort by Ditko and Mastroserio; these guys make a great team. I like the Ghost in spite of his weird references. David Kaler told spun a fairly good yarn. A well-done book but nothing too spectacular. I give Captain Atom #82 a B+. The story opens “somewhere on the outskirts of a major city.” Captain Adam and Gunner are sifting through the equipment left behind by Doctor Spectro. Cap hopes to find something that will benefit man, as Spectro had been working on a new way to fight diseases before he became a side-show performer and later criminal. After feeling the effects of Spectro’s light beams, Cap is convinced the doctor was on to something. Meanwhile, the disembodied spirit of Doctor Spectro positions itself just right in the atmosphere and is hit by five simultaneous bolts of lighting. The result is the birth of five mini-Spectros, each sporting a different colored costume. They quickly learn that each one of them has a single light power. The tiny Spectros begin collecting satellites and space junk to form a secret orbital headquarters. 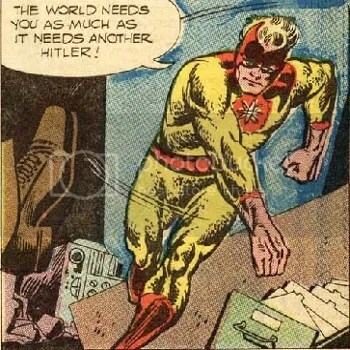 Back on the surface, Captain Atom is beating down some neo-Nazis who want to rule the world. Afterwards, while on a coffee-and-doughnut break (no kidding), Adam gets a call from his bosses. There have been reports of “little men” raiding defense stations and stealing valuable equipment. The little men fit Cap’s description of Doctor Spectro. 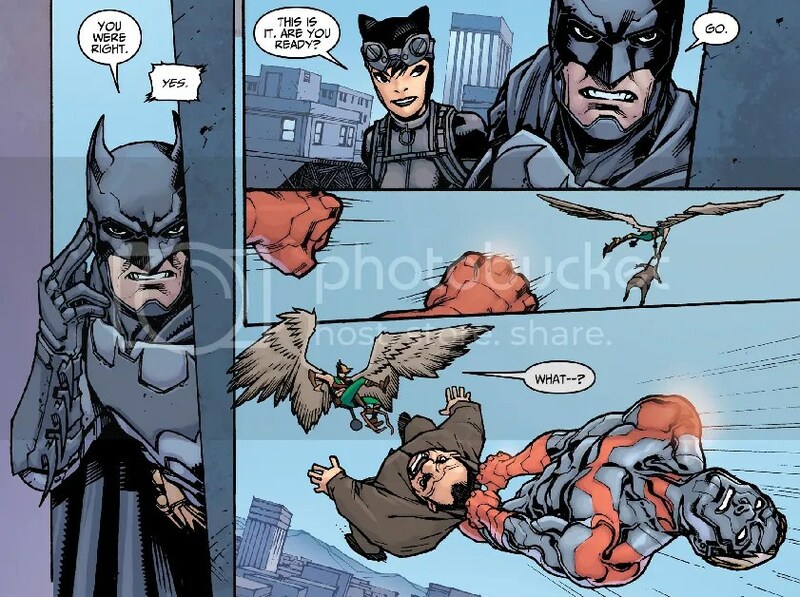 Adam puts the coffee and doughnuts down and flies back to the base to check in with Gunner. I love the way Steve Ditko draws Captain Atom flying. The movement of his body is very Spider-Man-esque. Ditko has a talent for drawing people doing these fantastic things but making it look natural. A nearby radio operator informs Cap and Gunner that the imps were spotted at the science center at Cape May. I’m guessing this is Cape May, New Jersey. Wherever it is, Cap wings it there in a hurry. The mini Spectros are in a lab looking for a safe, which they find hidden within a desk. Red Spectro heats up the door of the metal safe with his red beam after which Blue Spectro freezes it with his blue beam, making the door brittle, and it crumbles away. They are carrying off a box marked “SECRET DANGER” when Captain Atom bursts in. The two Spectros combine their heat and ice powers, which knocks out Cap. They grab the box and run off. When Cap comes to, he realizes the two Spectros were aspects of the original man. Captain Atom isn’t out for long. He puts up a shield to protect himself from the radiation Spectro is flinging about (but, earlier issues established Cap could withstand this sort of attack… here he says that without the shield he would melt). Yellow and Green lead Cap outside where they will outnumber him 3 to 1. Outside, Purple Spectro is worried his cohorts will use the little girl (Kathy) as a hostage. He leads her away to safety and then takes on Captain Atom. His inner monologue indicates he wants to merge all the Spectros back into one with Purple in control. He uses his beam (now blue) on Cap, which takes away the hero’s anger temporarily, making him not want to fight. Purple Spectro escapes (presumably with Yellow and Green close behind). Once Cap breaks the “spell” Purple Spectro put on him, he talks to Kathy. She tells him how the dwarf cured her. Cap realizes there is some good in Spectro, but he still has to take the evil genius down. After taking Kathy home, Cap’s commanding officer tells him to put the Spectro case on hold. 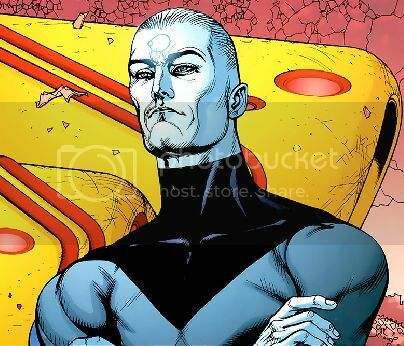 Turns out several satellites have stopped operating and he needs Captain Atom to investigate. Back on the surface, Kathy’s parents are having her checked out by a doctor. The doctor says he has reconstructed Spectro’s machine but doesn’t know how to make it work. In the upper atmosphere, Captain Atom comes across an unusual cloud formation. He finds it is concealing Spectro’s space station. The Spectros spot him before he spots them. Yellow wants to use his heat beam (so the Spectros do each have multiple beams). Purple convinces him to use his anger beam while Purple uses his happiness beam to confuse Cap. When they strike, Captain Atom sees it coming and erects a screen (an emotion screen? New power!). Cap punches Red and Yellow out. The remaining Spectros overpower him and knock him to the ground. Purple hits him with a sickness beam hoping Cap will pass out from the pain. 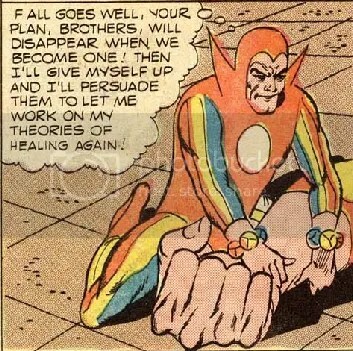 The Purple Spectro (mis-colored orange in the panel to the right) believes that once they are merged together, he can turn himself over to Cap and begin working on his theories and help people. Captain Atom breaks free but is overpowered by the imps. Purple Spectro manages to knock Cap out cold. While he is out, the Spectros activate their machine and begin to merge together. Cap awakens and tries to stop the machine by hurling a fireball at it (new power!) The fireball actually seems to help the process and the one true Doctor Spectro is flung from the resulting explosion. Cap turns Spectro over to the police, but it seems there is a lingering effect of the whole fiasco. Doctor Spectro appears to have five separate personalities and doesn’t seem to realize he has been reformed into one person. This issue also includes a short comic about UFOs and one about jiu jitsu as well as a strange editorial article entitled “The Strong Man.” It is nice to see Captain Atom doing traditional super-hero stuff and fighting a recurring villain. 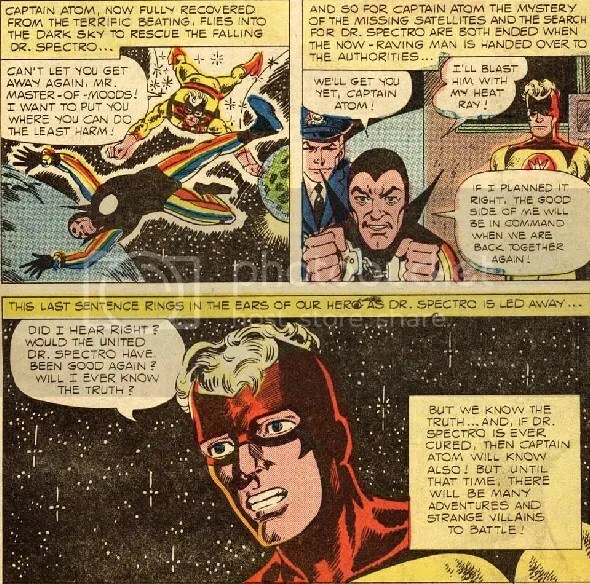 Doctor Spectro would be seen only one more time, in Crisis on Infinite Earths #10 before the character was revised in the 1987 Captain Atom series. The art in this issue is beautiful, Ditko was a master. The story was pretty good if hoaky in places. 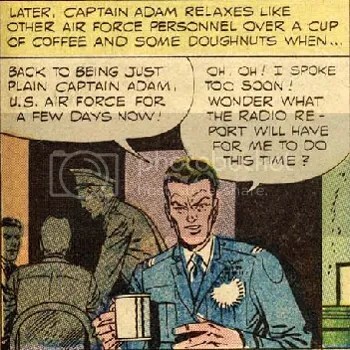 Definitely an A. I love Captain Adam relaxing over coffee and doughnuts. Note: Throughout this review, I have used the words “dwarf” and “imp” and the like. I realize, as a fairly well-educated 21st century man, that these terms can be offensive to little people. I only used them in the context that this comic book from 1966 used them. I do not condone the use of the words, which some may find offensive. They are used to point out how preposterous comic book dialogue could be (and sometimes still is). I am a firm believer in equal rights and suggest all Splitting Atoms readers check out the Coalition for Dwarf Advocacy, a non-profit charity formed in 2006 to advocate for the full rights and benefits of individuals with short stature (dwarfs), and their families within the public and private sectors of society.